The atmosphere at Cincinnati’s Rhinegeist Brewery is urban with roots in Over the Rhine’s 19th century brewing history. This wedding reception was held in a quiet space away from the main gathering space of the brewery. The warm exposed brick walls, wooden beams, and honey cafe lights cast a bourbon tinted glow over everything. 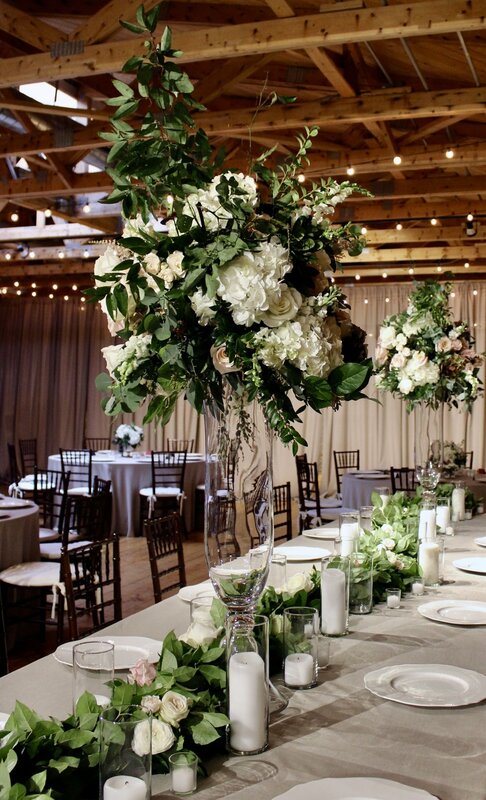 incorporated an abundance of local deep forest green foliage, blush and white roses, hydrangea, and astilbe. We created a long floral wall along the base of the bar, draping garlands behind the head table, and an assortment of tall and short arrangements at the tables. There was a never a moment when beautiful florals were not in sight!